« What If Retail Investors Are Smart To Ignore This Rally? While the Dow has surpassed its highs from last month, this has not been confirmed by other major indexes. 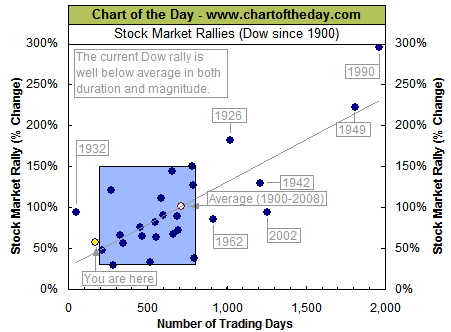 In any case, there have been 27 significant rallies in the past 109 years of market history - not counting the current one. That’s about one for every 4 years. Paul Desmond of Lowry Research pointed out this four year cycle as one of his reasons for believing this to be a real bull market. About three quarters of the rallies resulted in a gain of 30%-150%, lasting 200-800 trading days (9.5 months to 3.2 years). These are the data points highlighted in the blue shaded box above. The current rally is just shy of making it as it is too short in duration. van, that’s a tough one. There are many definitions floating around. According to Ned Davis, a bull market fulfills one of three conditions: (1) at least a 30% rise in the Dow in 50 calendar days, (2) at least a 13% rise in the Dow in 155 calendar days, or (3) at least a 30% reversal in the Value Line Geometric index.